Hi~ I found your blog while looking up homemade V8 recipes. Your chickens are so cute! We live in the city, but raise chickens and a couple turkeys on our small property. They love their veggie scraps like greens and tomatoes! I'll be sure to give them the yummy veggie pulp when I start juicing! Perfectly blended for their digestion. My chickens won't go out in the snow. They just stand in the doorway and look out at it. We're in New Hampshire, so they may get a bad case of cabin fever! 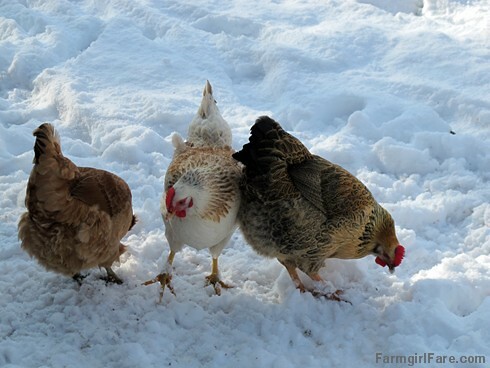 These chickens looks cute with snow under their cute feets. looks like they're all decked out for the new year with fluffy clean feathers... love the colors and patterns in their plumage.